Aldo Drudi design, captured in carbon fiber and titanium. Body work is all carbon fiber, frame is Ti. Seat area exudes the Drudi design genius. 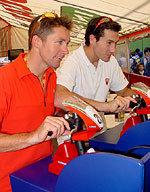 The Italian Poggipolini Group, famous for its titanium racing components found in and on many of the world's top factory roadracing bikes and Formula Once cars, recently purchased controling interest in the famous NCR racing shop, the team which sponsors Frankie Chili in SBK World Superbike. 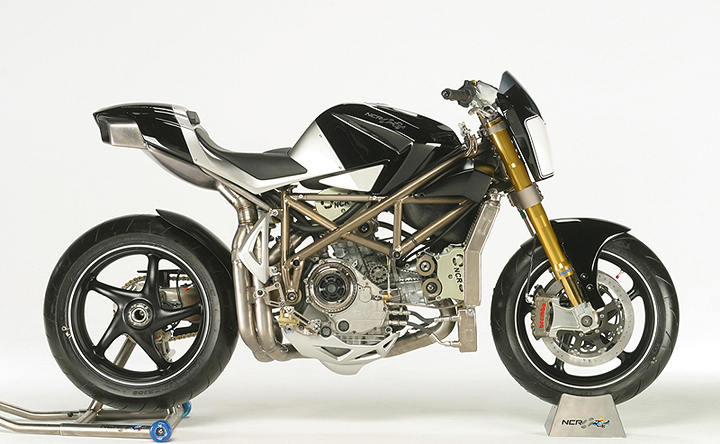 On display at World Ducati Week 2004 in may, we got to see this latest showcase of Poggipolini engineering magic named the Macchina Nera, the most outrageous monster naked bike imaginable. The Nera features a vast array of titanium components from its trellis Ducati replica frame, to the unique full-race exhaust system and various controls and engine components that are separately available from Poggipolini. 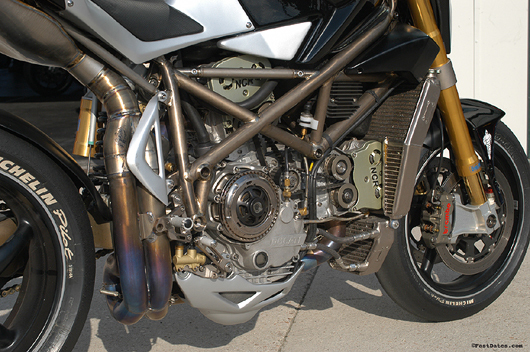 The engine is a full race Ducati Testastretta 998R engine rated at 180hp, housed in a bike that weighs just 297lbs. With all that power and almost no weight stuffed in a short 55.5 inch wheelbase you can bet the Nera is a serious wheelie monster. Definitely unique, the Macchia Nera bears little resemblance to the custom bikes we frequently see. How unique? Here’s how the plan unfolded. Stefano called on his good friend and business associate, Aldo Drudi—the famed Italian designer. “Il Signore Drudi” was given freedom to create a fresh and aggressive design. Stefano and Aldo casually walked next door to the NCR factory to see what parts they could come up with. Curiously, one of Frankie Chili’s WSB motors—a Ducati 998R testastretta engine from the 2003 World Superbike season, poised prominently before them. Could it be? Of course it could! 180 HP, 135 Kgs / 297 lbs. Road rage has met its soul mate. The Poggipolini Titanium craftsmen built a frame of gorgeous titanium to tightly encase the Testastretta superbike motor. They specified the finest components the world offers and ultimately framed their creative work with Drudi’s Italiano design. Fairings and ducts? Not a chance. The engine and frame on the Macchia Nera are twin crown jewels that need no accoutrements to enhance their beauty. The Macchia Nera is a natural beauty—a stunning naked world superbike that will be produced in a very limited number--precisely one. The finest technology in the world. Special parts from Formula 1, MotoGP and aerospace. The rear stand is done completely in titanium.The carbon fiber gas tank is crowned with a special titanium gas cap. Ultra-exclusive MotoGP Brembo brake system with 320mm double disks (centrally vented). Note fork control telemetry! Racing NCR radiator with Nipploy treatment. Aeronautical fittings adorn the titanium tubes. Directly from Poggipolini's F1 work, titanium connectors, PVD treated pulleys and titanium pulley ring nuts.The clutch system is EVOLUZIONE, treated in Nipploy and lighter yet than standard versions. Aerospace componentry ties the vital fluid lines together. style with Poggipolini/NCR artistic craftsmanship.Ohlins racing fork (53.5mm), the latest in fork telemetry. Brembo brakes with Poggipolini Titanium connectors (you've seen them on Ducati MotoGP bikes as well). Top it off with Marvic magnesium wheels! Poggipolini Titanium exhaust--in titanium, of course. If you want a Macchia Nera, purchase the only example. Macchia Nera No. 1 of 1 is yours for 150,000 Euros ($180,000). 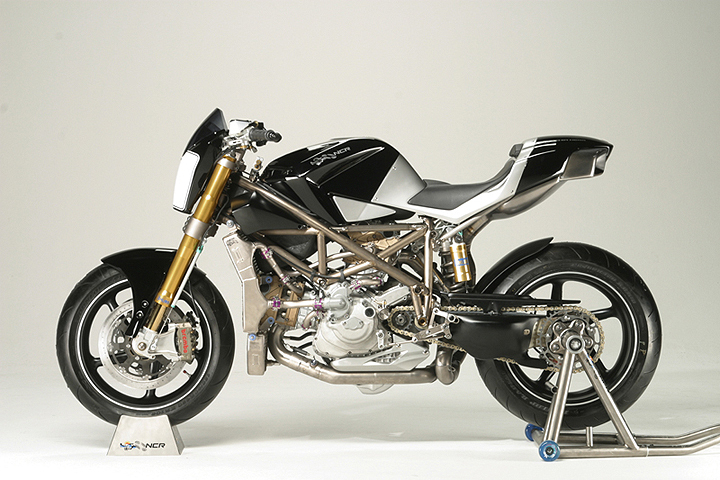 Stefano Poggipolini plans to bring the Macchia Nera to the Laguna Seca superbike races in July 2004. Frankie Chili will be there, the Macchia Nera will be there and, just perhaps, the proud and fortunate new owner of this exclusive superbike. Need to lighten your wallet or your bike? 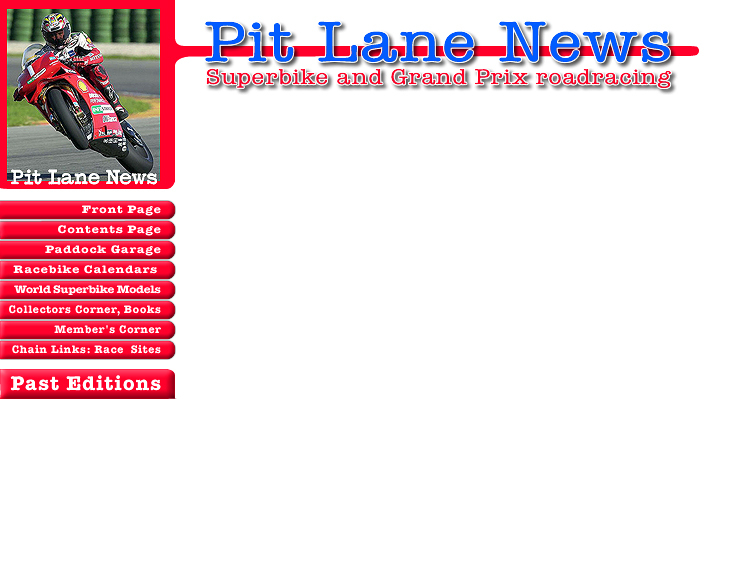 Just visit RaceMetal.com. Or write to contact CustomerCare@racemetal.com if you are interested in purchasing Nera #1.